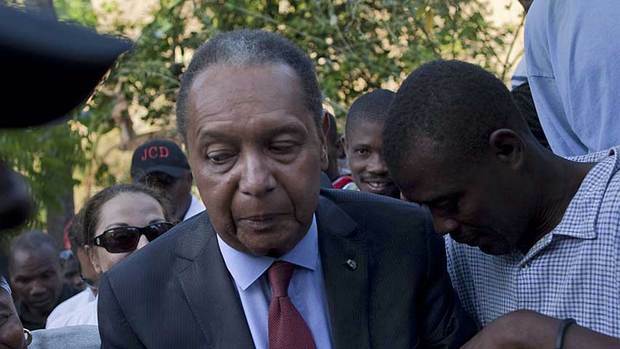 Jean-Claude “Baby Doc” Duvalier, Haiti’s former ruler, has appeared in court for a hearing to determine if he can be charged with crimes against humanity. It was the first time Baby Doc Duvalier, who failed to appear at previous hearings, had faced some of his alleged victims. Jean-Claude Duvalier returned to Haiti in 2011 after spending 25 years in exile in France. Human rights groups say hundreds of political prisoners were tortured or killed under Baby Doc Duvalier’s rule from 1971 to 1986. Opponents and supporters of Baby Doc Duvalier turned out for the hearing, with some of his alleged victims just metres away from him in the packed courtroom. Supporters dressed in the black and red colors symbolic of Baby Doc Duvalier’s rule chanted “Long live Duvalier” as he entered the courthouse. Jean-Claude Duvalier’s lawyers had asked for the session to be held in private, arguing he was unwell. The hearing was requested by his alleged victims, who want to see him stand trial for crimes against humanity. Last year, a judge ruled that Baby Doc Duvalier should be tried for embezzling public funds but that the statute of limitations had run out on charges of murder, arbitrary arrest, torture and disappearances. That ruling is contested by human rights organizations, which argue that under international law there is no time limit on prosecuting crimes against humanity. Baby Doc Duvalier is himself appealing against the decision to try him on any charges. Now a three-judge panel must decide whether the former leader should face trial. Three previous attempts to hold the hearing had to be postponed when Baby Doc Duvalier failed to turn up. Baby Doc Duvalier was just 19 when he inherited the title of president-for-life from his father, Francois “Papa Doc” Duvalier, who had ruled Haiti since 1957. Like his father, he relied on a brutal militia known as the Tontons Macoutes to control the country. In 1986 Baby Doc Duvalier was forced from power by a popular uprising and US diplomatic pressure, and went into exile in France.